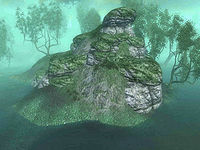 The Hill of Suicides is a large hill rising high above a lake that serves as the Isles' purgatory (quest-related). The inhabitants of the hill are all ghosts whom you are unable to speak with. Each of these ghosts once committed suicide to end the agony of life. They are now stuck atop this hill in eternal half-life as punishment for not dying according to their lord's will. You must find and return each of their skulls in order to release their spirits and end their torment. Just east of the hill, in a bend of the path connecting The Low Road to Split, is a graveyard with five gravestones. It is possible that these are the graves of the five spirits. This page was last modified on 25 March 2017, at 18:34.